Mmmm. Black beans, ginger, garlic and chilies. Cephalopods for dinner. Doesn’t sound very enticing, does it? Oh, but it is. 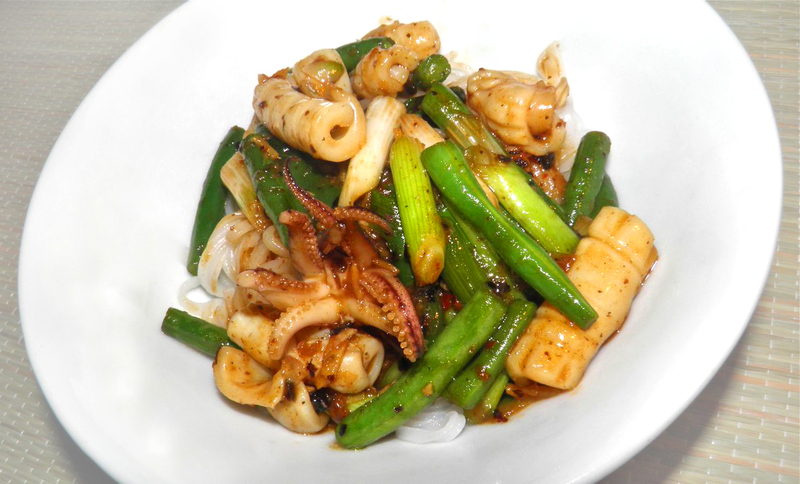 If you don’t eat cephalopods you’re missing out on a wonderful seafood ingredient. The two main beasts we consume in the classification are squid and octopus, but there are others that would do in a pinch. before adding in the green onions and squid pieces. Both squid and octopus have a unique property, sort of an old chef's tale, but it holds truth. Either cook them for 30 seconds or 30 minutes. Anywhere in between and they will be tough. If you have never eaten either I’m not sure how to describe the taste. They certainly don’t “taste like chicken.” What a stupid saying. Chicken tastes like chicken. Period. Think about eating a partially spoiled chicken breast, steak or an egg. Not very pleasant, right? The same holds true for seafood. You can't expect something to taste good if its spoiled. Most squid is frozen on-ship so is actually about as “fresh” as you can get it if you buy it still frozen. Of course there’s the process of cleaning squid, which can turn some people off. But not me. I'm tough. For those who aren't you can buy pre-cleaned squid tubes. (Actually that's what I do most of the time...) They’re far easier to deal with, and have the benefit of you not having to extract the parts we don’t eat, shall we say. Kind of like buying a whole cleaned chicken as opposed to one that was running around 15 minutes previous. I like squid. Quite a lot, actually. Maybe this recipe will make you like it too. It’s a quick recipe once you have the prep done – easily accomplished in a hurry on a weeknight. If you can't stomach squid substitute shrimp or scallops, in equal quantity. Or combine one third pound of each! Toss well to heat through and coat the squid. First deal with the squid. Split the tubes open. Take a knife and score a small diamond pattern on the inside side of the tubes, taking care to not cut all the way through. Then cut the tubes into about 2” x 2” pieces (5 cm square). Plunge the cut squid into salted boiling water for 30 seconds and then drain. The pieces will curl and the diamond pattern will be revealed. 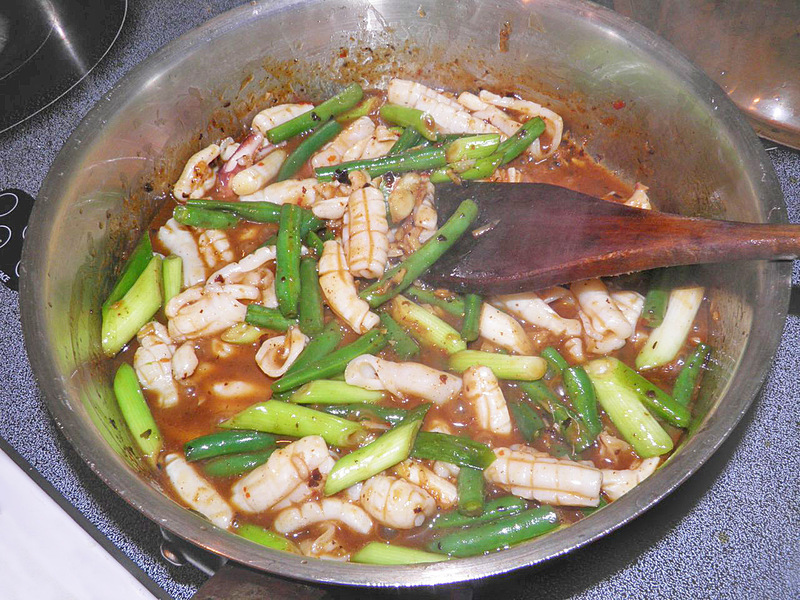 The scoring helps the squid pieces retain sauce. Clean the beans and chop into 2” pieces. Chop the green onions into 1” lengths. Heat the oil in a wok or flat bottomed sauté pan. Mash the fermented black beans with the sugar until fairly fine. Add the chopped garlic and chopped ginger. These are your aromatics. Add the aromatics to the hot oil and fry for 1 minute. Then add the chili paste. How much you add depends on the brand you have and how much heat you want. Sauté for another minute. 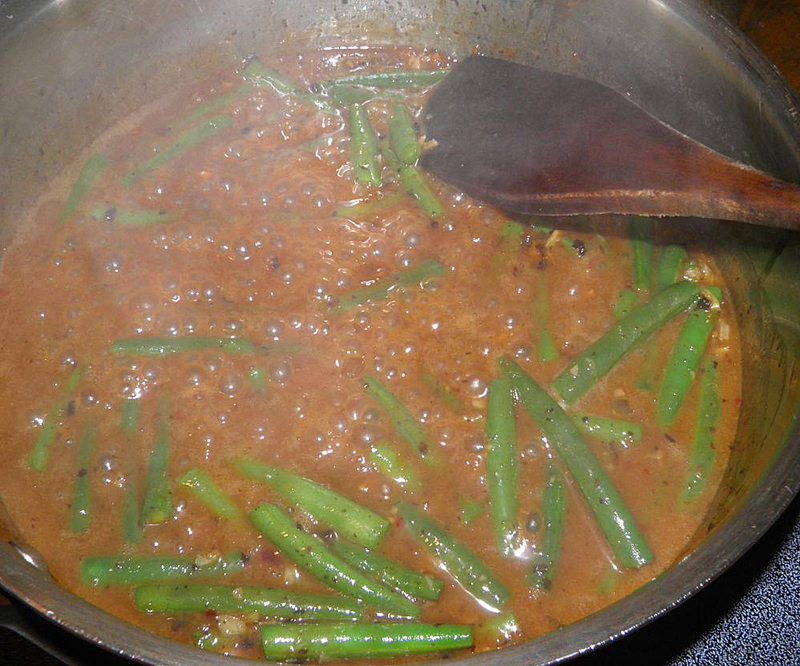 Add the coconut milk and green beans. Cook until the sauce thickens ad the beans are partially cooked. 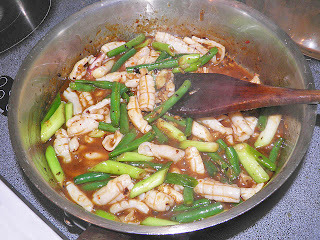 Then add the squid and green onions. Toss to heat through, taste for salt and pepper, and serve on the rice vermicelli.